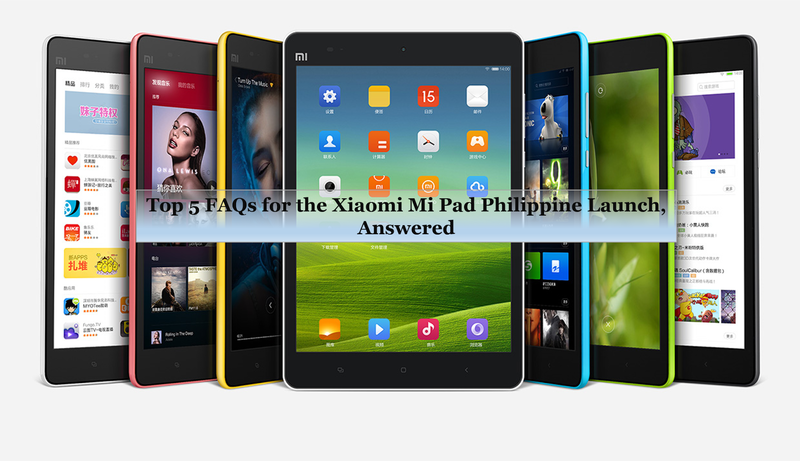 In the advent of the Xiaomi Mi Pad Philippine launch, we have answered the Top 5 Frequently Asked Questions about the device. Check it out here! The Xiaomi Mi Pad will be officially released in the Philippines. This slate is the bestselling tablet of the popular Chinese brand who have brought the Mi 3 and Redmi 1S smartphones in the country. The Mi Pad will gun for the iPad mini and Samsung Tab S market share due to the fact that they are similar in terms of feature set. With the device’s popularity, we have answered the top 5 frequently asked questions to keep you all updated. 1. The Xiaomi Mi Pad Specs? The Mi Note-maker has a lot things to bring on the table with this upcoming release– 7.9-inch QXGA IPS display with 2048 x 1536 pixels at 326 ppi pixel density, Gorilla Glass 3 screen treatment and MIUI skin based on Android 4.4.4 KitKat to name a few. 2. How fast is Xiaomi Mi Pad? This tablet is fast enough to be your daily driver. Likewise, the device also boast the NVIDIA Tegra K1 chipset which packs both the 2.2GHZ quad-core ARM Cortex A15 CPU and NVIDIA Kepler graphics. Thus, if you are a gamer by nature, this tablet will not disappoint. The chipset is also coupled with 2GB of RAM to make things even more buttery in terms of multitasking activities. 3. How about the camera? Can I call and text using this device? On the camera department, the device will have an 8MP-2MP combo for your pointing-and-shooting needs. Unfortunately, this slate will be limited to WiFi connectivity so there’s no texting and calling functions here. Across the board, you will have 16GB native storage which is also expandable up to 128GB. Plus, the device will be powered by a 6700-mAh battery to keep everything ticking while you’re away from the wall outlet. 4. When and where to buy Xiaomi Mi Pad in the Philippines? The Xiaomi Mi Pad Philippine launch date was not disclosed yet. However, we are certain that we will have the White 16GB version of this slate. Of course, basing on history, the device will only be available for purchase in Lazada like its previously released smartphones. 5. How much would the Xiaomi Mi Pad cost in the Philippines? The slate will cost Php 10,999. With beefy features and powerful performance, it would definitely be a good deal. Check out the rest of the specs below.